AMERICA’S GOT TALENT may be starting to show its age. NBC: The season premiere of AMERICA’S GOT TALENT easily won the night, but its 2.6 rating was down 0.4 from last year’s premiere. The compatible lead-out I CAN DO THAT premiered at 1.8, a strong start for a 10PM summer series. ABC: After a steady 1.1 for 500 QUESTIONS, EXTREME WEIGHT LOSS had a downbeat season premiere at 0.9, down 0.4 from last summer’s premiere. FOX: ARE YOU SMARTER THAN A 5TH GRADER returned from a 7-year hiatus at an unexciting 0.8, followed by 1.1 for HELL’S KITCHEN. CW: A NY sports preemption may shift the number, but for now, IZOMBIE showed no impact from its much lower lead-in (an 0.4 FLASH rerun rather than last week’s 1.5 season finale), holding at 0.6. 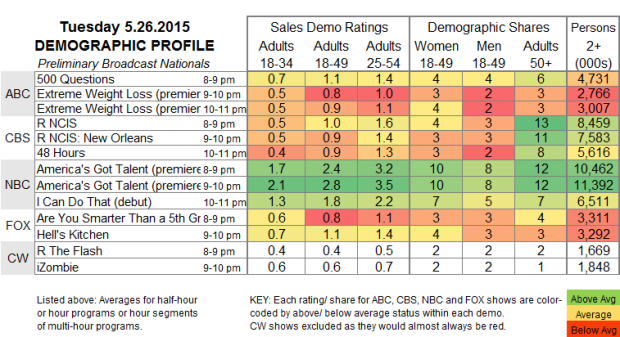 CBS: Reruns, led by 1.0 for NCIS. The summer unscripted shows keep arriving tonight, with THE BRIEFCASE on CBS and BULLSEYE on FOX. In addition, NBC has the IHEARTRADIO COUNTRY FESTIVAL music special. CABLE RATINGS: Come back early Wednesday morning for detailed demographic ratings for top cable programs from this day. Come back this afternoon for Monday’s cable ratings, as the Memorial Day delays begin to subside.